Children who have siblings automatically have friends, rivals, competitors and even, on occasion, enemies. Children who also have speech disruptions often find that their siblings can either torment them, help them and/or protect them like no one else. Including siblings in speech practice, then, is an important step towards keeping the whole family on the same page. Not only will including siblings help raise awareness for them about what their sibling does during speech practice, but it should also help encourage the sibling who is practicing and create more fun for all involved. The joining sibling does not become competitive or “show off” speech skills. The practicing sibling does not become embarrassed or non-compliant due to a new presence. They do not all become silly and forget to focus on the speech practice. They do not turn attention to new games rather than focusing on those set out for practice. The joining siblings do not appear bored or uninterested for the duration of the practice. No one makes the practicing sibling feel slow or stupid. No one rushes through the practice to get it over with. The general tone of the group remains positive, enthusiastic and motivational. Many siblings may be aware that a brother or sister goes to speech therapy and practices at home, but they may not know what these tasks really entail. Including siblings in at home practice allows them the chance not only to witness such activities, but to join in to find out what it is like to do them as well. The first few practices together is a great time for a parent or the practicing sibling to explain what they will do next, why and how it will help the speech disruption. After a few sessions the joining siblings may not longer need such explanations, but surprise questions throughout (“Why do we do this tongue twister?” “Why do we sing this song?”) can help remind them that they are there to help. Before bringing siblings into an at home speech practice it is a good idea for parents to remind them that their encouragement will be a big help to their brother or sister. 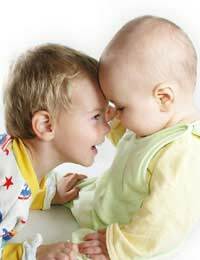 Reminding the practicing sibling that it is polite to thank their siblings for their help should also motivate everyone involved to maintain a positive tone. There is a fine line, however, between encouraging kids and forcing them to do things so if a natural encouragement doesn’t seem to flow between siblings you may need to rethink why and how you have decided on such an arrangement. Repeating silly tongue twisters together. Singing along to the same songs or even creating duets. Reading aloud to each other with dramatic voices and gestures. Making up stories sentence by sentence. Playing board games focusing on reading questions to each other. Playing card games and focusing on children requesting cards with full sentences. Creating imaginary games and explaining the rules to each other. Devising plays with speaking parts for each sibling. Speech practice can be a monotonous time for children, but including their siblings can make it much more entertaining. As long as the tone stays positive, including siblings in speech practice can help raise awareness, encouragement and fun!